If you want have audio effect to midi or want to convert midi to wav,mp3,..ect then you need to have soundfonts installed.A soundfonts is available here http://us2.un4seen.com/files/ChoriumRevA.rar. Download that file, extract to iCoolPlayer install folder and rename "ChoriumRevA.SF2" to "midi.sf"
iCoolPlayer is freeware media player. iCoolPlayer is powerful when working with Sound. (from computer, LAN, Internet). User can choose to write the streaming file to disk. DirectX Effect: Chorus, Compressor, Distortion, Echo, Flanger, Gargle, I3DL2 Reverb, Param EQ, Waves Reverb. Build In Effect : Amplify, BandPass, Channel Order ,Compressor, DownMix, Dynamic Amplify, Echo/Delay,Flanger, HighPass, LowPass,Notch, ParametricEQ,Phase Invert, Phaser, Pitch Scale, Pitch Shift, Sound 3D, Tempo,Treble Enhancer, True Bass. + ConvertAudio : Convert mp3/ogg/wav/aiff/wma/aac/ac3/alac/ape/mac/mpc/ofr/spx/tta/wv/cda/midi/flac to mp3*/ogg/flac/wma/aac/mp4/ac3/ape/mpc/spx/wav/wv. Apply directly 28 DSP Effect/Equalizer/Mixing to the output. Make sound better. 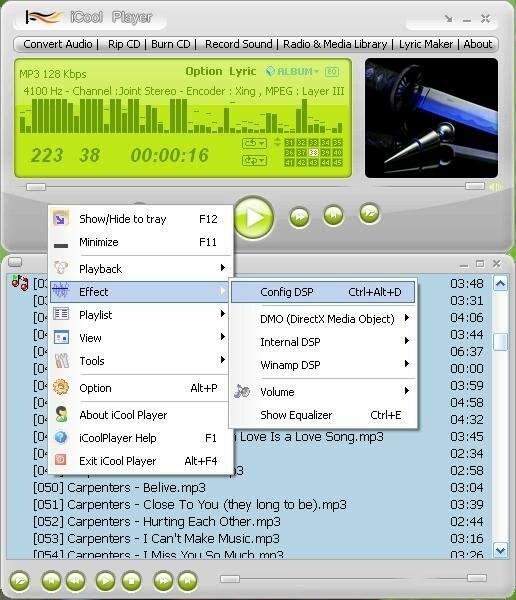 + RipCD : Read CD-TEXT. RipCD to mp3*/ogg/flac/wma/aac/mp4/ac3/ape/mpc/spx/wav/wv. Apply directly 28 DSP Effect/Equalizer/Mixing to the output. Make sound better. Download and then rename it to lame_enc.dll (if it name different) and copy to iCoolPlayer installed folder (it should be "C:\Program Files\iCoolPlayer"
At this moment i was too busy, so please a later time until i got more time to do this work. Thank you for interested in iCoolPlayer Project. Copyright© 2005-2007 by Kenshin1101 (Nguyễn Nhật Dũng). All rights reserved.